The style of food at Robert Sayre’s new restaurant has confused some passersby. “We’ve had to convince Pittsburgh that it’s a New Mexican restaurant, not a ‘new’ Mexican restaurant. So that’s been a bit of a struggle at times,” Sayre said with a laugh. Sayre is the owner and head chef of Mesa, a restaurant that occupies the space in Schenley Plaza where Conflict Kitchen once stood. Mesa opened in mid-June and serves New Mexican food, with lunch and dinner menu items spanning from enchiladas to tamales. Wednesday additionally kicked off the first day of Mesa’s breakfast service, served from 8 to 10 a.m.
Sayre’s parents have lived in New Mexico for several years, and as a young child Sayre recalls visiting his uncle who lived there as well. According to Sayre, New Mexico has distinct characteristics which set the state and its cuisine apart from nearby areas. That cultural blend includes Spanish influences, Native American influences and influences from Western settlers, according to Sayre. “It’s cuisine that’s based around corn, bean and chiles for the most part,” Sayre said. The idea for a New Mexican restaurant was rooted in Sayre’s quest to find a type of food that resonates with Pittsburghers but is hard to find in the area. Menu items include green chile stew with pork and potato and tostadas — hard, flat tortilla shells with different toppings. Chiles are a staple in the southwest, and hard tortilla and taco shells, like those used in the tostadas, originated from New Mexico and northern Mexico. “New Mexican, southwestern kind of Sante Fe style cuisine kind of fits that mold as something that’s familiar, theoretically, to people but there’s not actually a New Mexican restaurant in Pittsburgh,” Sayre said. Sayre is no stranger to the location of his new restaurant. As the culinary director at Conflict Kitchen, which occupied the space previously, Sayre devised the menu, ran day-to-day operations, traveled abroad and cooked with and learned from native people in the countries he visited. 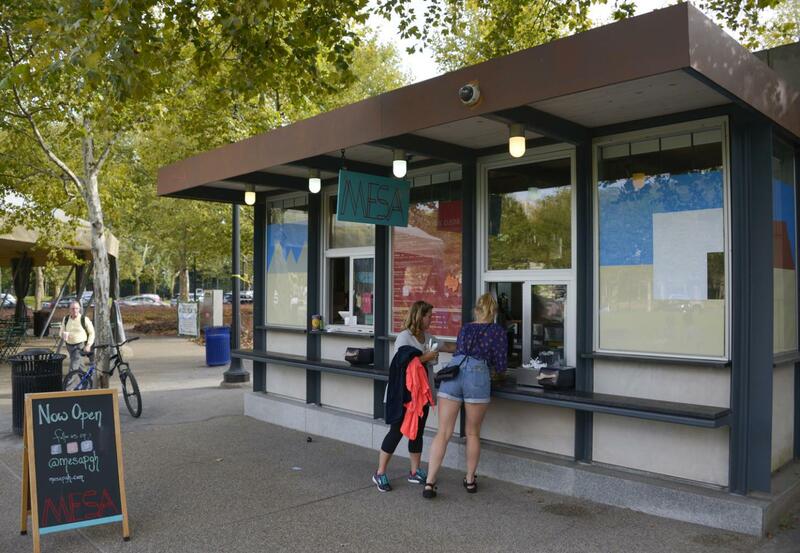 Conflict Kitchen offered foods that contrast sharply with the New Mexican cuisine now served in Schenley Plaza, including Cuban and Iranian food. Elise Musser, a first-year biology major at Pitt, said when she toured Pitt she had an opportunity to eat at Conflict Kitchen, but she prefers the flavors at Mesa. She said she’ll definitely be stopping by in the future. “I have one of my classes over in Frick, so when I come back to my dorm [I’ll eat here],” Musser said. Carnegie Mellon University oversaw the administration of Conflict Kitchen, which closed in May. Sayre said of his current nine employees, seven worked at Conflict Kitchen, and Mesa has been able to guarantee a base rate of $15 per hour to all employed. While he enjoyed his time at Conflict Kitchen, Sayre likes the freedom he has to run his new restaurant. Three of Mesa’s employees have lived in New Mexico, including Sheryl Johnston, Mesa’s sous chef. Sayre feels like this adds a certain authenticity to the food. Monica Abraham, a senior mathematical biology major at Pitt, ate lunch at Mesa a couple of weeks ago. She enjoyed the meal and said the prices were reasonable for people on a college budget. Sayre said Mesa’s menu would be changed up throughout the winter. “We’ll have a bit more soups and stews and things like that as it gets colder,” Sayre said. Having grown up in a town with a number of authentic Mexican restaurants, Rachel Sides, a senior biomedical engineering major at Pitt, said she could tell Mesa’s cuisine was distinct from Mexican food. Particularly, the addition of squash to the dishes was something she enjoyed but had never seen before. “The flavors are different and the ingredients are different, but it kind of feels like a Pittsburgh spin on it almost,” Sides said.